Imagine walking into a bakery, smelling of fresh baked goodness, and actually being able to eat everything on display behind that glass wall? For gluten-eaters, this is quite normal, but for those of us that are gluten-free, it’s a rare occurrence. I’ve gotten used to walking into bakeries and other places with yummy treats, and finding my options limited to a cup of coffee or hot tea. Good news, gluten-free Atlantans! A new bakery just opened that provides customers with delicious, gluten-free food. On Monday I had the opportunity to check out Sally’s Bakery, a brand new, entirely gluten-free bakery that just opened this week. Located at 5920 Roswell Road, in Sandy Springs, this bakery was well worth battling Lenox Mall Christmas traffic! Sally’s Bakery is owned and operating by Sally Owings with the help of her brother, Taylor, mother and father. Sally, Taylor and their mom, Bonnie are all gluten-free. Sally and her mom have been baking in their kitchen ‘laboratory’ for years and friends finally convinced them that they should open their own bakery. I’d like to thank those people because I’m thrilled to benefit from Sally’s entrepreneurial endeavors! I got to meet the whole family when I stopped by Sally’s and they were all enthusiastic about their products and eager to serve Atlanta’s gluten-free community. The first Sally’s item I tried were her chocolate chip cookies. 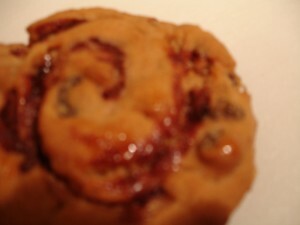 Now I make my own chocolate chip cookies that I’m very proud of but Sally’s were equally delicious. David, my resident gluten-eater, loved them too! He even asked the next night if we could have them again for dessert. 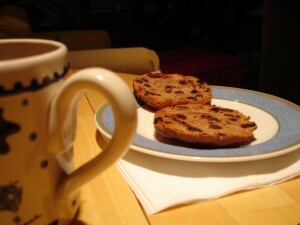 In addition to the chocolate chip cookies, I also bought Sally’s Honey Nutty Bread and Cinnamon Raisin English Muffins. The English muffins smell so good and taste just as delicious as their scent. David and I ate them for breakfast and it is without question, the best ‘bread item’ I have eaten since going gluten-free. I toasted mine and put cream cheese and Linden jam on my muffin. It was pure gluten-free foodie delight! Look at all of that cinnamon swirl goodness! On Tuesday night we ate the Honey Nutty bread toasted with leftover lentil squash stew. It was a perfect simple, but hearty, supper for yet another rainy Atlanta night. The bread’s texture was nice and it tasted delicious with honey and butter. You could also use it for sandwich bread as well. This bread was also a hit with my glutie, David. I’ll be slicing up the remainder of the loaf and freezing the slices in zip lock bags for future use. 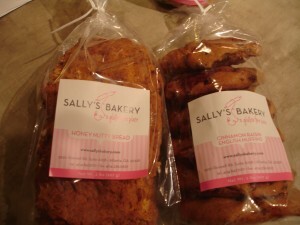 Sally’s labels clearly list all ingredients on the packaging and she is extremely knowledgeable about her baking. Many of her products are dairy and egg free, and they are very helpful in guiding you towards the products that will best fit your dietary needs. I didn’t buy one of Sally’s pizzas but she makes pizzas with a variety of toppings as well as two dairy-free pizzas. (All of her crusts are gluten, dairy and egg free.) Sally uses a pine nut pesto instead of cheese for her dairy-free pizza. A creative idea instead of just covering the pizza with fake, dairy-free cheese. I might be buying one of their dairy-free pizzas in the future simply because I love pesto! I highly recommend checking out Sally’s Bakery. As of now, their hours are 10-6, Monday through Friday, and 10-2 on Saturdays. Sally does ask that if you have a particular order in mind, that you call a day in advance so that they can make sure to have what you want. Even if you forget to call in advance, you should still go to Sally’s because they always have yummy items for sale. Let me know what you’ve tried from Sally’s and how you’re incorporating it into your gluten-free meals! Great news for gluten free baseball fans. One of the only gluten free concession stands in the country is at Turner Field. No longer do I have to watch everyone else enjoy a cold beer and a hot dog, while I’m eating a protein bar. Take me out to the ball game! From Aramark: The Atlanta Braves and ARAMARK, the exclusive food and beverage provider at Turner Field, have announced the opening of a dedicated gluten-free concession stand for fans with Celiac Disease. The location opens Friday, Sept. 4, behind Section 106, and will feature all-beef franks, sirloin beef burgers, chicken sandwiches, chips, popcorn, brownies, cookies, soda, water and gluten-free RedBridge beer. 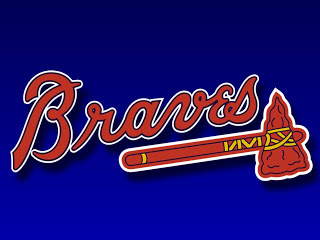 Check out the Atlanta Braves website for their game schedule. Thai Shirlington is another wonderful discovery in the gluten free dining world! The other night I decided to call the restaurant and see if they were familiar with a gluten free diet. Tthe manager I spoke with on the phone told me that they had many gluten free diners and she assured me that they could accommodate my diet. Thrilled by this news, my friends and I went to Thai Shirlington that evening and the manager was so helpful. She took me through every item on the menu and told me what I could and couldn’t have. This was so helpful and it allowed me to know what all of my options were from the beginning. I went with the Panang Perfect and it was delicious as well as naturally gluten free. This meal comes with rice, but their rice noodles are also gluten free. She also knew that soy sauce has gluten in it. Some of the other gluten free items on the menu that I’m eager to try are the green curry chicken and chicken pad thai. If you go to Thai Shirlington, and I encourage you to do so, just ask for the manager to help you through the menu. They’re extremely friendly and the manager assured me that once the waiter took my order, she would follow up with the kitchen. My friends have gone to many restaurants with me since I started my gluten free life, and one of my friends who was at dinner with me commented that this was one of the best and most helpful restaurants she’d been to with me and she’s right! I highly recommend Thai Shirlington if you’re in the mood for yummy (and reliably gluten free) Thai food at a very reasonable price!